For whatever reason, you have decided you want to know more about me and this blog. All right, here goes. First of all, this is the blog where I post about the lessons, trials and tribulations I pick up along the road to becoming an author. It is by no means intended as a “How-To” for writing. It is rather, a journal of sorts – an accounting of anecdotes and lessons I learn along the way. Who am I? Well, first the ugly truth. Yes, that’s really me in the picture to the left. In the immortal words of Adam Sandler in 50 First Dates, “I’m sorry I’m not better looking.” (Probably not as sorry as my wife is, though.) 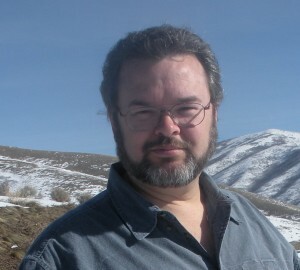 8-) That pic was taken in February of 2009 while we were on vacation in Salt Lake City. The storytelling gene was inescapable. A father whose daredevil adventures personified the rebellious preacher’s son, a Choctaw mother, and a veritable cast of characters in the family made for lots of “Did you hear about?” stories, as well as the inevitable oral histories. Influenced by martial arts, trigonometry, Star Wars, and ice cream, Jeff finally decided what he wanted to be when he grew up—which should happen any day now—an author. His long-ignored and oft-lamented Attention Deficit Disorder notwithstanding, you hold in your hands the result of many years of patient writing, re-writing, research, and long hours at the computer. Jeff’s incredibly organized and intelligent wife’s influence may be noted in this novel, but she in no way claims responsibility for any of the content, other than to say the story could use some “spice,” which is what you would expect from a fan of J.D. Robb. Jeff and his family live somewhere near Houston, Texas, with two “goggers,” three kids, one grandchild, and Dead Tehya, the cat. Half Past Midnight is his debut novel. Note from the author: And that, dear reader, is what you get when you allow your wife to write your bio page! So, that’s the canned response from my book, or any of a half-dozen other sources related to Half Past Midnight. I like to think there may be a bit more to me than just that, but where does a page go from “About the Author” to “Every Nauseating Detail the Author Could Think of to Write About Himself, Because He’s a Narcissist”? Well, if you’ve read up to this point, you’ve no one to blame but yourself. I’ll try to keep the rest short and sweet. If you want to know more, just ask. And that’s about it. If you’re a real glutton for punishment and want to know more, you can check out my “Sm1ley’s Musings” site, drop me a comment either here or there. Or if you’d rather, you can just “tweet” me (there is a “follow me” link in the column to the right), or email me at jlb.author@gmail.com. Hi Jeff. Wanted to catch up with how your new book is coming. Hope you and your family are doing well! Also wanted to let you have my new email addres. Take care and tell everyone hello. Hi Linda. I’m doing well. We all are. As for the writing, I’ve got a novella written, edited, and ready for the cover artist and formatter – another novel about halfway finished – and a collaboration novel with another writer that is just getting started. And then there is also an idea I’m working on for a sequel to Half Past Midnight. Lots of plans… now all I have to do is turn them from plans to reality. I noticed “R A C ” on the cover of Half Past Midnight, but can’t find anything about it. What’s it stand for? Hi Jon. Actually, it’s an “R A S” award, standing for “Red Adept Select“. I’m pretty proud of that, as their tagline is “Voted Outstanding in Genre”, which I suppose means that I must have done something right. Hi Jeff, I just finished reading “Half Past Midnight,” and loved it. Now my 17-yr old son is reading it and is every bit as enthralled. PLEASE write a sequel – soon!! Thanks so much for the vote of confidence Linda. And please thank your son for me, too.